Based in St James Business Park, Knaresborough driving test centre can be found near TSG Consulting, Newtons Solicitors and Clarity Copiers. A popular choice for learners in Harrogate, Knaresborough test centre has plenty of tricks up its sleeve. If you've decided to head here for your practical test, we'd advise you get to know it a better. Read on for directions, pass rates, test routes and much more about Knaresborough. Knaresborough test centre is around 15 minutes from the centre of Knaresborough itself, resting near the River Nidd and the A658. Easy to get to for learners located in and around Harrogate, you won't have trouble finding Knaresborough test centre—you can find exact directions here. Looking for the Knaresborough test route? Unfortunately, you won’t be able to find the exact route, as the DVSA no longer publishes routes. If you're taking a driving course with a local instructor, however, this won't be a problem. Your instructor will introduce you to a variety of roads that are likely to feature on your test. By honing your skills on these town roads and residential areas, you'll be better prepared for your practical. To see which specific roads might show up on your test, check out videos of Knaresborough test routes on YouTube. As you can see, learners at Knaresborough test centre have fairly good chances of passing—better than the national average! It’s important not to depend too much on pass rates, however, as it’s all ultimately down to how you perform on the day. What If I Can't Go To Knaresborough? Knaresborough test centre isn’t the only place to take your test at in North Yorkshire. If you can’t head there, the nearest alternate centre is York. Finished your driving lessons? You should be more than ready to face your practical test. Now all you need to do on the day is get to Knaresborough 10 minutes early—with your provisional, or you won't be able to take your test. Once you get back to Knaresborough test centre, you’ll get your results. You'll be able to see where you picked up driving faults—if any—with the feedback sheet given to you by your examiner. If you're successful, you'll also get your test pass certificate. You can then hand over your provisional in order to send off for your new licence. It’s the question on every learner driver’s mind—what if I fail? While it’s disheartening to fail your practical test, it’s not the end of your journey. Rebooking is a simple process and as long as you remember your examiner’s feedback, you should pass with flying colours. PassMeFast can speed up the entire process by fast-tracking your test. To get booked in, contact us on our website, or give us a ring on 0333 123 4949. Instead of opting for single lessons that take place weeks apart, why not take an intensive or semi-intensive course? By doing so, you can build up your driving knowledge and experience over a short span of time with one of our experienced instructors. 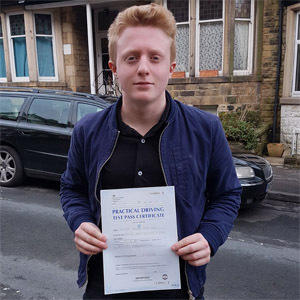 And with our fast-track practical tests, you can speed up the entire process without worrying about long driving test waiting times. Don’t prolong your journey to getting on the road. Check out our course prices and give us a ring on 0333 123 4949 to get more information, or book a course online to get the ball rolling today. The whole experience from start to finish was excellent —easy to book and the test came through in less than a week. Would highly recommend this company.